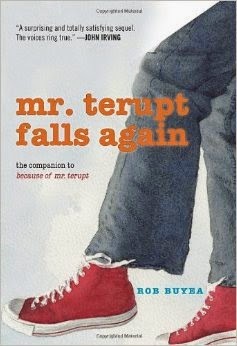 Maybe author Rob Buyea knew that it would be impossible for the students of Mr. Terupt's class to loop with him yet again, but he crams too many adolescent crises into his sequel, Mr. Terupt Falls Again. Among other dramas, there is an abandoned baby, a fight over land ownership with Native Americans (really), a marriage proposal between two teachers, pressure to smoke and do drugs, multiple first periods, and a search for an absent father. That isn't even close to all the events that are squeezed into this book. The result of all these storylines is that I felt a bit of whiplash as we switched between chapters. I found myself wondering, “Danielle, which one is she? Ah, overweight, religious, land dispute…” I’m sure that young readers would have the same confusion. If I was Rob Buyea, I would have saved some of these ideas and written another book from the perspective of the beloved, but undeveloped character of Ms. Newberry. Mr. Terupt Falls Again just didn’t work for me the way the original did. Still, sixth grade readers who enjoyed the first book will like to read this to get a happy ending for all the characters.